A studio class of fourth-year architectures majors at MSU recently developed ideas for a recycle-reuse process known as functional symbiosis. Among winners were (third from left to right) Megan Vansant, Kevin Flores, Aryn Phillips and Nenyatta Smith. Also pictured are (far left) project juror Patrick Sullivan and former MSU architecture major Keith Findley. With them are (at far right) juror Daria Pizzetta of H3 Hardy Collaboration and architect Jim Findley, an MSU alumnus. STARKVILLE, Miss.--Mississippi State architecture graduate Jim Fennell and former architecture major Keith Findley may be credited with helping their alma mater bring a recycle-reuse process called "functional symbiosis" to Mississippi. "Functional symbiosis" takes place when a business takes steps to share waste disposals and, ultimately, help protect the local environment. Fennell and Findley met while attending Mississippi's only university architecture program leading to licensure. As career professionals, they returned to MSU recently to share concepts of a working model of functional symbiosis developed in Colorado at a commercial complex known as the Ivywild School. Once a Colorado Springs elementary school, Ivywild was repurposed to become a brewery, bakery and community garden. Through a functional symbiosis system, excess water from the brewery is used to water the garden, spent grains from the brewery go into the bakery's bread and so on. According to Fennell, when businesses are able to form a functional symbiotic relationships, they also help lower operating costs by reusing materials and become more profitable. In 2013, the two former students approached Michael Berk about getting MSU architecture majors involved in helping spread functional symbiosis throughout the Magnolia State. Berk directs the architecture school and holds its F.L. Crane Professorship. "I think [the project] can really do good things for the state," Findley said, adding that he felt the MSU students are "our best resources for solutions." Fennell and Findley's idea happened to fit perfectly with what assistant professor Alexis Gregory already had planned to teach in a fourth-year class. Inspired by what she had learned at an Association of Collegiate Schools of Architecture conference, she was dedicating the 2014 fall semester to inspiring her studio students to begin thinking more about recycling and reuse. With funding from Fennell and Findley, the Ivywild Studio at MSU's architecture school was born. Gregory began by creating a series of recycling, reuse and functional and community symbiosis projects. Early versions helped the students develop concepts that would be installed in their final projects. Collectively known as "Starkville Symbiosis," their work involved research and creation of designs for a hypothetical building in MSU's hometown that would feature what they had conceptualized. Their hypothetical site at the corner of Jackson and Lampkin streets involved three real clients: Ed Dechert and Cameron Fogle, founders of Starkville-based Sweetgum Brewing; and Troy DeRego of DeRego's Bread. In addition to being a baker, DeRego is a web communication manager in the MSU Extension Service. Dechert also is an MSU engineering instructor. 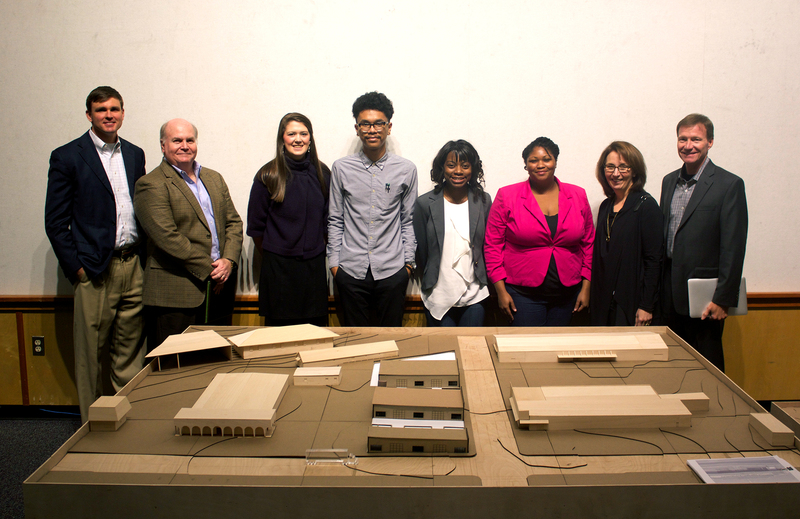 In addition to Dechert, DeRego, Fennell and Findley, the MSU students presented their final concepts to a jury of architecture and sustainability professionals, all who of whom agreed the creations illustrated the positive impacts such projects could have on the state. Patrick Sullivan, president of the Jackson-based Mississippi Energy Institute, was one of the judges. Of the IvyWild Project, Sullivan said, "There's just not anything like that in Mississippi." He went on to further praise their goals of having nothing--air, water and or steam emissions--leave the hypothetical site, "except products that are being sold and, of course, people coming and going. "Taking that kind of approach is just smart," he added. --First place to Megan Vansant of Hunstville, Alabama, the daughter of Donald R. and Rebecca W. Vansant, and second place to Kevin Flores of Forest, the son of Jose and Teresa Flores. Both also received $1,000 each. --Honorable mentions to Aryn Phillips of Olive Branch, the daughter of William and Luretha Phillips, and Nenyatta Smith of Gulfport, the daughter of John and Dorothy Smith. CORDOVA, Tennessee--Emma Morse, daughter of James M. Morse and Charlene Smith. CLINTON--Devin Carr, son of Neil and Sandra Carr. HERNANDO--Patrick Brown, son of Chet Brown and Earline Wallace. HORN LAKE--Daniela Bustillos, daughter of Jaime and Maria Bustillos. JACKSON--Lorianna Baker, daughter of Duke and Karen Baker. PADUCAH, Kentucky--Ryan Bridges, son of Michael Douglas and Delinda Kay Bridges. PICAYUNE--Cody Smith, and son of Ray and Christina Renderman. SNELLVILLE, Georgia--Ryan Mura, son of Ryan L. and Susan D. Mura. In addition to Sullivan, project jurors included Allison Anderson, FAIA, LEED-AP, and John Anderson, AIA, LEED-AP of unabridged Architecture in Bay St. Louis; Daria Pizzetta, AIA, LEED-AP, of H3 Hardy Collaboration in New York City. Others were Jeremiah Dumas, MSU's sustainability coordinator; Bob Wilson, executive director of the Mississippi Main Street Association; and Phil Hardwick, former project manager for MSU's John C. Stennis Institute of Government and Economic Development.